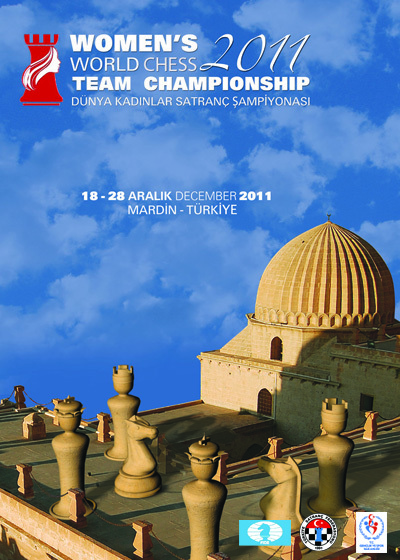 Welcome to round one of WWCT in Mardin! I’m a bit too late with this foreword - the clocks have been started already and the first round is in progress while you’re reading this text, so I’ll just drop a few words concerning today’s matches. Top seeded China is a clear favorite against young ambitious Turkish team, but that will not be an easy walk for Chinese. Georgia vs. South Africa and Armenia vs. Greece looks like a comfortable warm-up for experienced Caucasian teams, so there will be no surprise if they are going to win. The morning of the first day of the championship, on the 18th of December, started with early work for the team captains. The technical meeting started at 10 a.m. in the spacious playing hall. The captains were welcomed to the hospitable Mardin, reminded on the main regulations of the competition by the President of Turkish Chess Federation Ali Nihat Yazici and the Chief arbiter Erdem Ucarkus. Then the drawing of lots started. Each captain was to choose from the 10 souvenirs on the display that hided the numbers from 1 to 10 inside. You can see team compositions by clicking on the national flags at the top of the tournament page. Most Syriac Orthodox churches and monasteries in the city were built on ancient Assyrian-Babylonian temple sites and some are still active today. The Syriac Orthodox Saffron Monastery was founded in 439 AD and is one of the oldest monasteries in the world and the only one that is still functioning in southern Turkey. From 1160 until 1932, it was the seat of the Syriac Orthodox Patriarch, until the Patriarchate relocated to the Syrian capital Damascus. The site of the monastery itself is said to have been used as a temple by sun worshippers as long ago as 2000 BC. Mardin is likely the Maride and Marida of the Greeks and Romans. Another important church, Kırklar Kilisesi (Church of the 40 Martyrs), originally built in the name of Benham and Saro, the two sons of the Assyrian ruler who executed them because they chose to become Christian, dates from 569 AD, and even during its use as a capital by the Artukid Turkish dynasty which ruled Eastern Anatolia and Northern Mesopotamia between the twelfth and fourteenth centuries. The 12th century Sitti Radviyye Madrasa, the oldest of its kind in Anatolia, dates from this period. The lands of the Artukid dynasty fell to the Mongols who took control of the region in 1394, but the Mongols never directly governed the area. Mardin was later controlled by the Turkic tribes who came from Central Asia Akkoyunlu kingdom. The Kasımiye Madrasa was built by Sultan Kasım, son of the Akkoyunlu Sultan Cihangir, between 1457 and 1502. In 1517, Mardin was conquered by Ottoman Turks.